Sweden, which suffered the highest losses in the Indian Ocean tsunami for any country outside of Asia, is commemorating those who died. 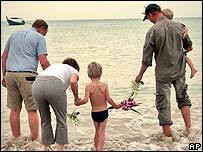 Five hundred and forty three Swedes were among around 2,400 foreigners who died on 26 December 2004. Official ceremonies were being held in Sweden, and hundreds of Swedes attended ceremonies in Thailand. Around 20,000 holidaymakers from Sweden were in the region when more than 220,000 were killed by the wave. Ceremonies were also being held elsewhere in Europe - including events in Germany, Finland and Norway. One of the vigils attended by Swedes in Thailand was broadcast on Swedish television. "Even the sky cries with us today," Bishop Lennart Koskinen said in Swedish as a rain fell on the mourners in the Khao Lak beach resort. 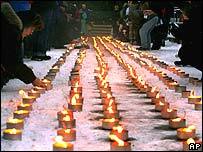 In Sweden, a minute's silence and the lighting of 543 candles marked the lives of each of those who died. The royal family attended a ceremony at Skansen, in Stockholm. "The catastrophe entered our homes and ripped apart our families," Swedish Parliament Speaker Bjorn von Sydow told mourners braving the cold at the outdoor ceremony, AP reported. Foreign Minister Laila Freivalds had already announced that she would not be attending the public ceremonies after drawing criticism for her reaction to the crisis. The government was condemned for its slow response to help survivors and families of relatives.